A sonic microscope, rotating fir branches, and portraits made out of yeast were only some of the artworks on display at the Science Gallery during the launch of their new exhibition, Open Labs. Visitors and participants gathered for the launch party to see an exhibition which, according to the Science Gallery website, “blurs the boundaries of what experimentation can be and invites visitors to become part of the process”. Billed as “part-exhibition, part-experiment”, the show aimed to encourage participation from the visitors, as the curators viewed the exhibit not as a finished product, but as a starting point. Guests were welcomed with a drink token for wine and beer, as well as a piece of a puzzle designed to be completed with the rest of the attendees. Music from the digital radio collective, Dublin Digital Radio (DDR), played in the background as guests made their way through the various displays. As soon as the doors were opened, the building was abuzz with activity, as participants played with the displays. The call for participation and engagement is immediate. On the ground floor are works by the art initiative, Hackers & Designers. An installation called “Momentary Zine” stands in one corner, inviting guests to make their own magazines, preferably with the microphone conveniently perched at its stand nearby; with the help speech-to-text technology, anything a speaker announces through the mic is printed out on paper within minutes. Meanwhile, on the other side of the room is a machine called “DataPools”, designed to trick your phone into appearing in a billionaire’s home, so that anybody seeking to track it down will be led to the pool of your choice of billionaire CEO, be it Jeff Bezos, Bill Gates, or Mark Zuckerberg. Each display is meant to be tinkered with, a direct contrast to what one may ordinarily see in an art gallery. There are no velvet ropes here; the usual barrier between the artwork and the viewer is broken down, and each participant is encouraged to touch pieces that, in a traditional gallery, they would not have had the permission to. Upstairs, the displays call for less participation, but are engaging nonetheless. The first thing that visitors see as they ascend the stairs, and perhaps the most eye-catching and intriguing display in the gallery, is the wall of rotating fir branches. Named by artists Laura Beloff and Jonas Joergensen as “The Condition”, each fir branch is designed to rotate according to their exposure to microgravity. The installation is designed to test the Nordmann fir Christmas tree’s ability to survive under changing environmental conditions. A classic example of human interference with the natural environment, the species has gone through artificial selection and novel cloning techniques in order to satisfy our need for the “perfect” Christmas tree. Beloff and Joergensen question what life forms will survive with or without us in changing environmental conditions. Environmental questions such as this can be seen across the exhibition. Across from “The Condition”, for example, are artifacts of plastic that has merged with the rocks. Further down, in the space beside the Paccar Theatre, is an exhibition called “Symbolic Grounding”, by artists Christian Faubel and Wolfgang Spahn. A kinetic light and sound installation which demands the space of the room and the attention of the visitors, “Symbolic Grounding” aims to give visitors a glimpse of the complexity of the human nervous system. A network of 100 artificial analogue neurons represents the interaction of the more complex network of 86 billion neurons that we have in our body. The rhythm and patterns of these interactions can be seen and heard using devices such as loudspeakers, motors, an oscilloscope, liquid-light projectors, and an xy-recorder. Visible wires run through the devices before joining together in the middle of the room. The contrast between the cold, hard machines featured in the installation and the natural processes in humans that they represent makes for a poignant and profound display. 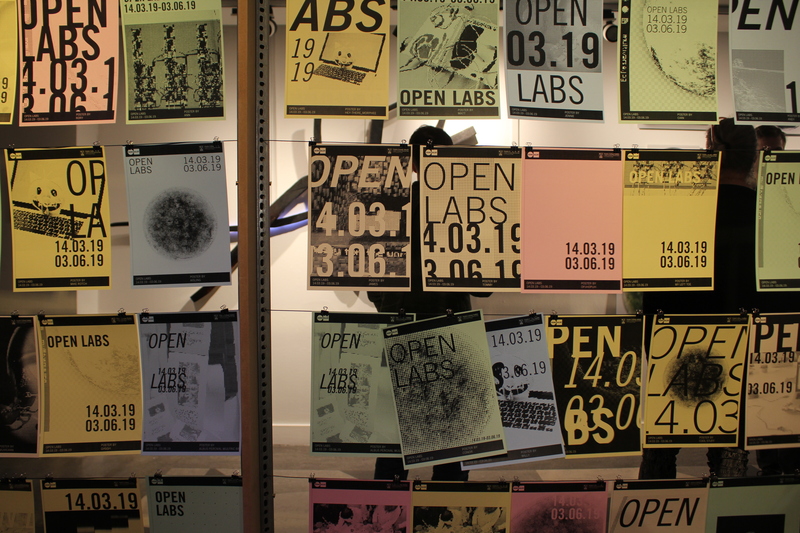 Open Labs boasts impressive feats in technology and engineering, and addresses a variety of important issues such as our changing planet and the invasion of our privacy, but these are not the ideas that stay in the visitor’s mind long after they have left the gallery. What is truly memorable about the exhibition is that it showcases a complete amalgamation of science and engineering. It blurs the lines between biology, chemistry, physics, and technology, and allows viewers to get a glimpse of all that is possible when interdisciplinarity between the sciences is achieved.